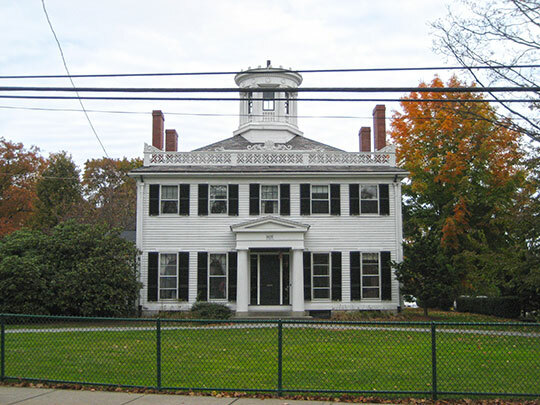 Melrose City Hall is located at 562 Main Street, Melrose, MA 02176; phone: 781-979-4500. Photo: Beebe Estate, ca. 1828, 235 West Foster Street, Melrose, MA. Listed on the National Register of Historic Places in 1981. Photographed by User:User:Grk1011 (own work), 2008, [cc-by-3.0 (creativecommons.org/licenses/by/3.0)], via Wikimedia Commons, accessed August, 2013. Melrose was first settled around 1629, incorporated as a town in 1850, and incorporated as a city in 1899. The Boston and Maine Railroad opened here in 1845. Formerly a part of the City of Malden, Melrose was known locally as North End or North Malden. In the 1930s it was home to the manufacturer of "Boston Baked Beans" which were sold coast to coast.